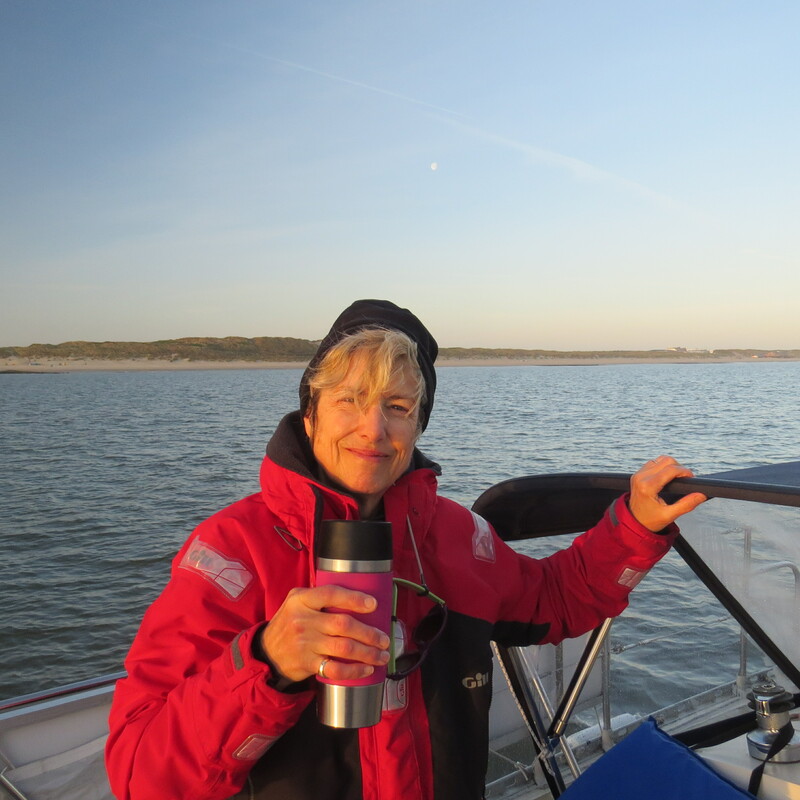 We moved JUANONA from one Friesan island to another: Terschelling to Vlieland, six miles to the west. Last year we used Vlieland as our departure/ arrival port to/from Norway so we were familiar with the marina and town. 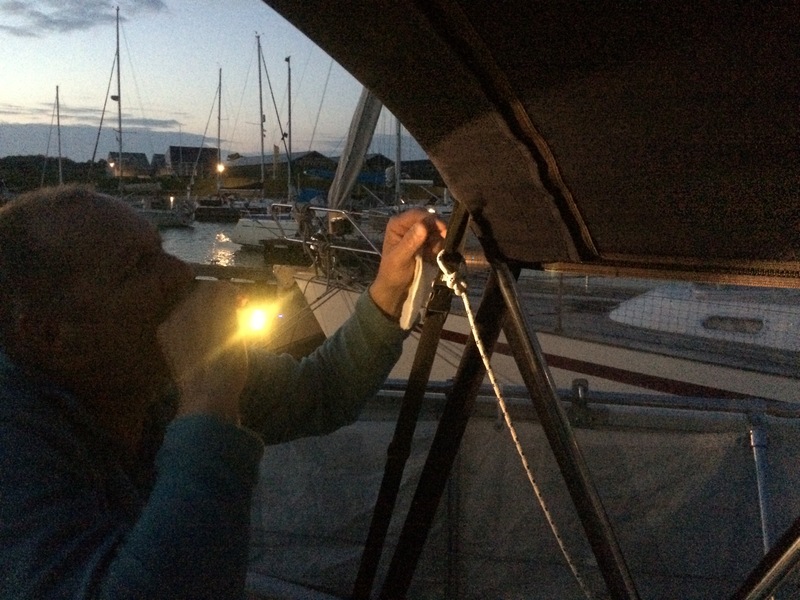 We ended up finalizing our provisioning in bits and bobs as we waited for the winds to start blowing from the south/southwest for our beeline to Norway. 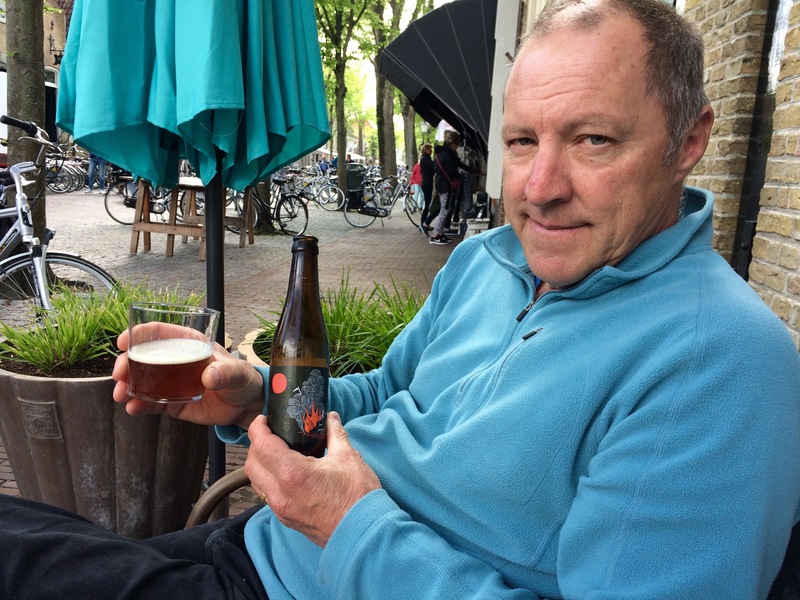 While in the lively, one-street town we took advantage of just sitting with a libation and people-watching. Part of the prepping meant relieving JUANONA of the numerous spider webs that grace her facade. Thankfully, we (royal ‘we’) now have a new night-time sport: spider hunting. Max has become quite proficient as I saw when accompanying him on one of his safaris. He offered me the opportunity to join in and crunch some but I said no thank you; so, he merrily continued on as the solo hunter. I’m just glad he does it because we’ve seen some huge ones ready to pounce on our faces in the V-berth. Anyone who’s woken up with a swollen eyelid knows what it’s like to be bitten by one of those dangling, eight-legged anthropods. Knowing your puffy eyelid was due to a spider crawling on your face is just one Big, nasty UGH feeling. Since this will be our fifth time crossing to Norway, I could say this specific passage-making is becoming routine, but that’s not the truth. In effect we don’t treat any passage as routine, with the exception of knowing (1) we’ll be on a boat in open sea with no land in sight for awhile and (2) what clothes we have on when we left will most likely be the same clothes we peel off when we land. And, yes, laundry machines are what I hunt for when in port. 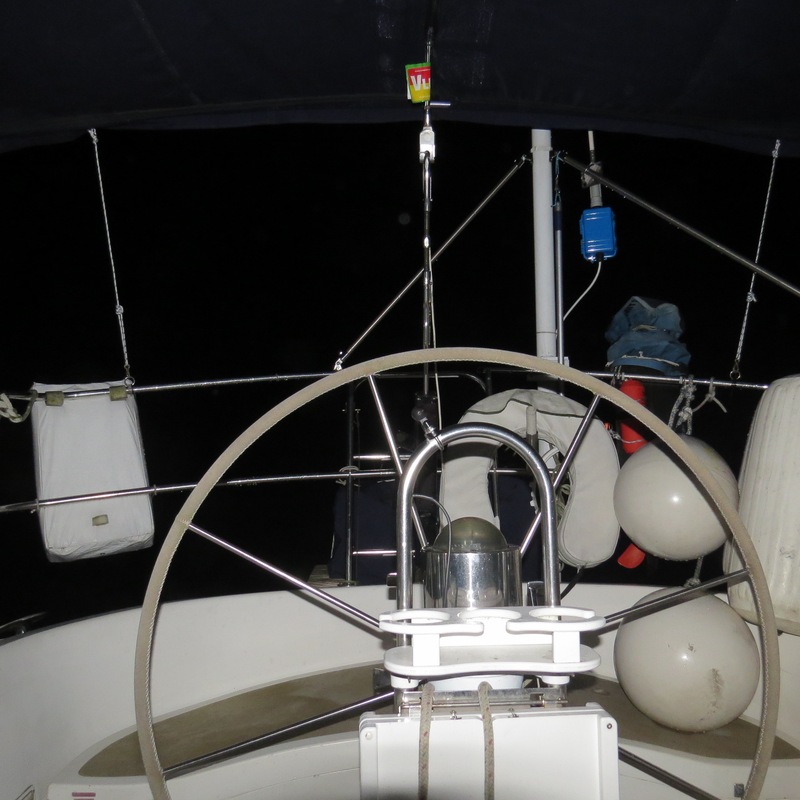 To catch a good tide running out, we left before 6am and motored then sailed into the North Sea. With a perfect wind forecast of 10 knots S/SW, later building to 20 knots, the morning ride out from Vlieland was lovely and not too cold. reading, listening to music, and contemplating belly buttons while staring towards the stern as JUANONA rolls with the waves. 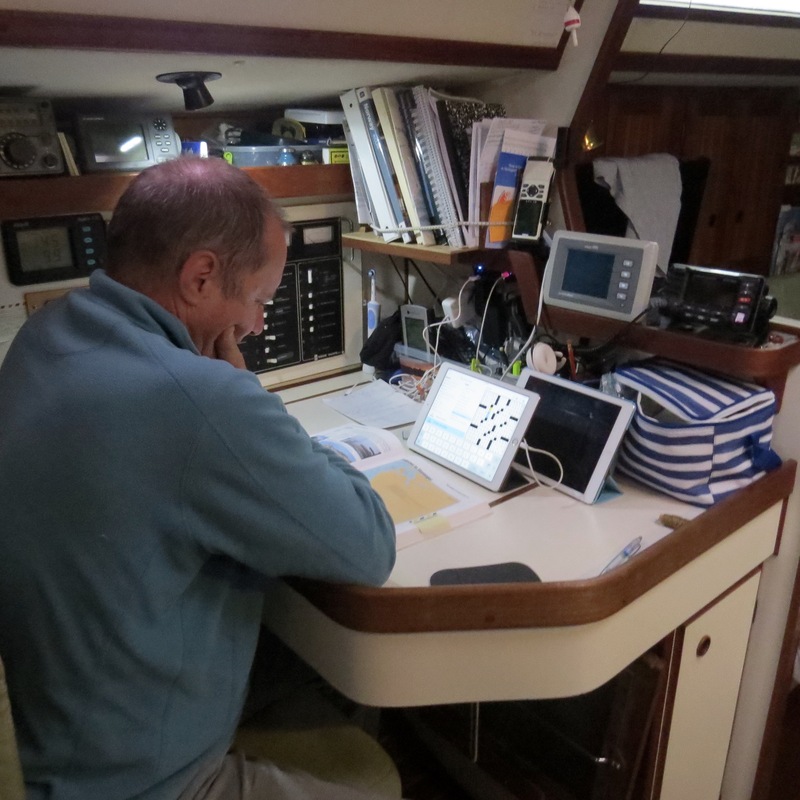 Underlying these activities is reviewing notes on harbors, sites, etc., for our summer cruising. 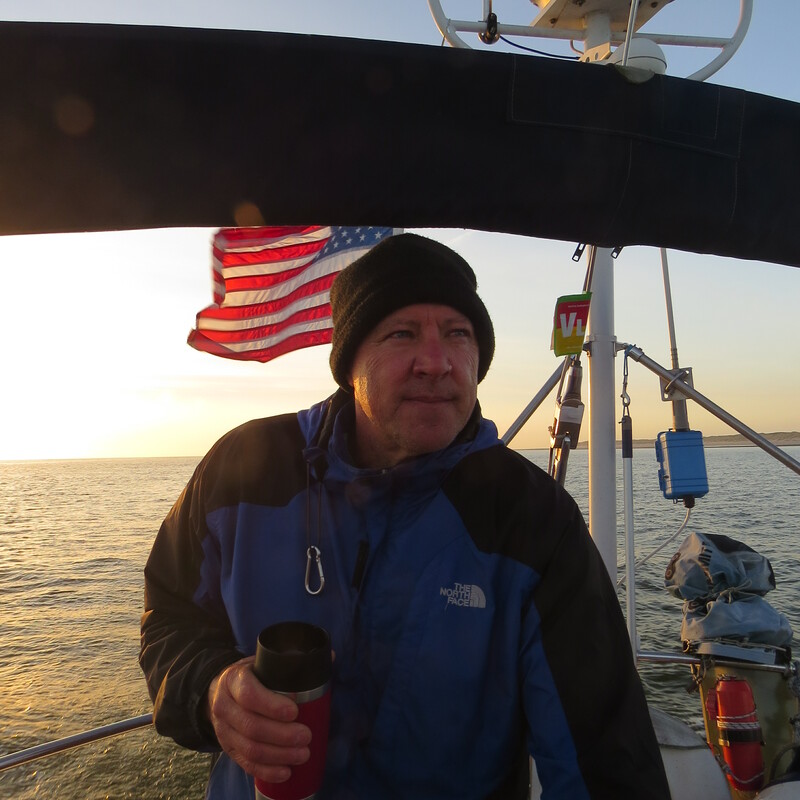 Thankfully, those who have explored these waters over the years have generously provided excellent information either in emails, articles published by sailing associations or cruising guides researched and written by sailors. We use all of those sources to get an idea of where we’d like to go and what to expect when we arrive. 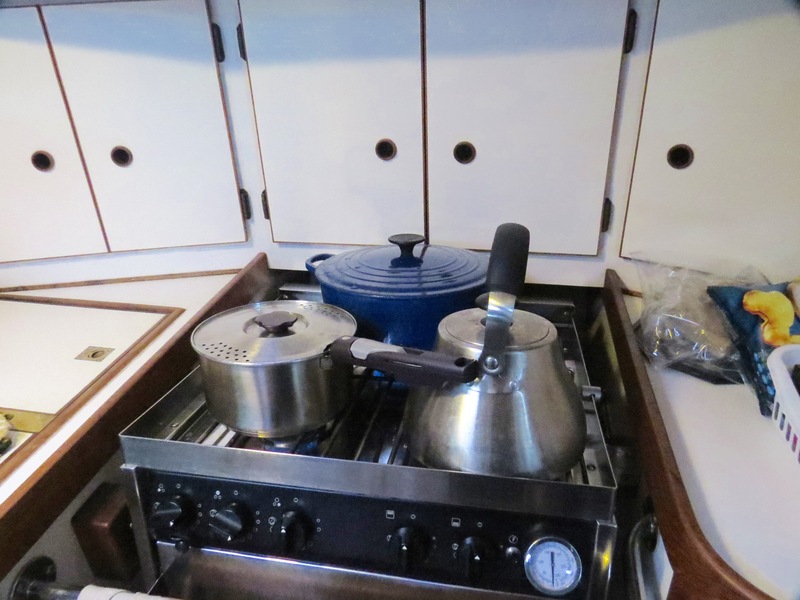 I had anticipated a chilly crossing just because the temps have been in the 50s; but, we were perfectly warm with our diesel Reflex heater located in the main cabin. 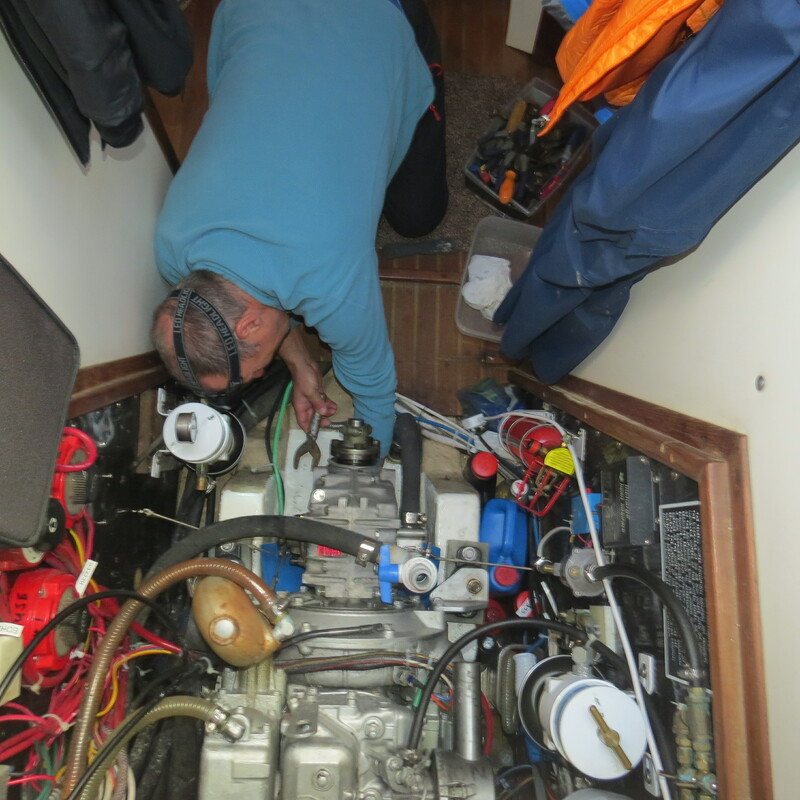 Of course, if you’ve left a dock, something is bound to cause a hiccup, which is why Max had to tighten the stuffing box to reduce water leaking in. Beginning our passage just after a full moon we were hoping for moon-lit nights, but both evenings sported cloud coverage and no–and, I mean zip/nada/zilch/NO–visibility. Which is why the Automatic Identification System (AIS) is a boon to navigation. 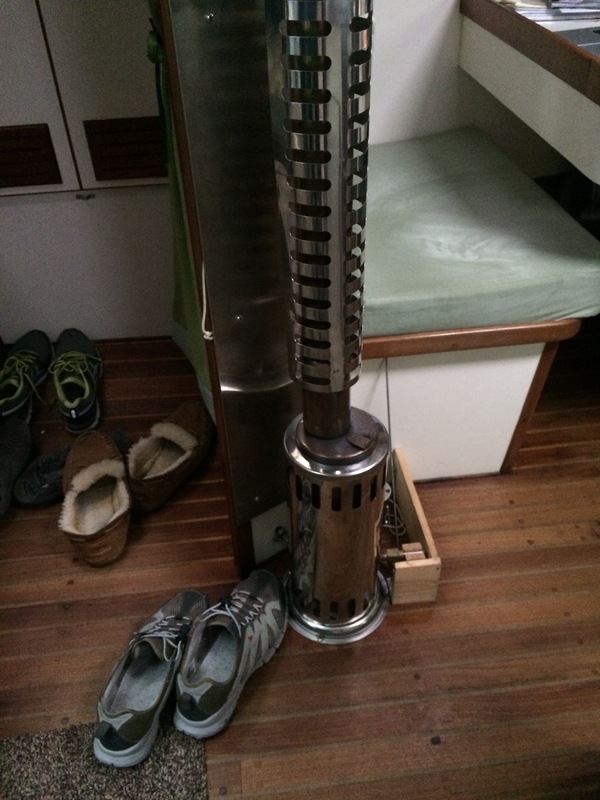 For me, the AIS has become the holy grail of our passage-making. 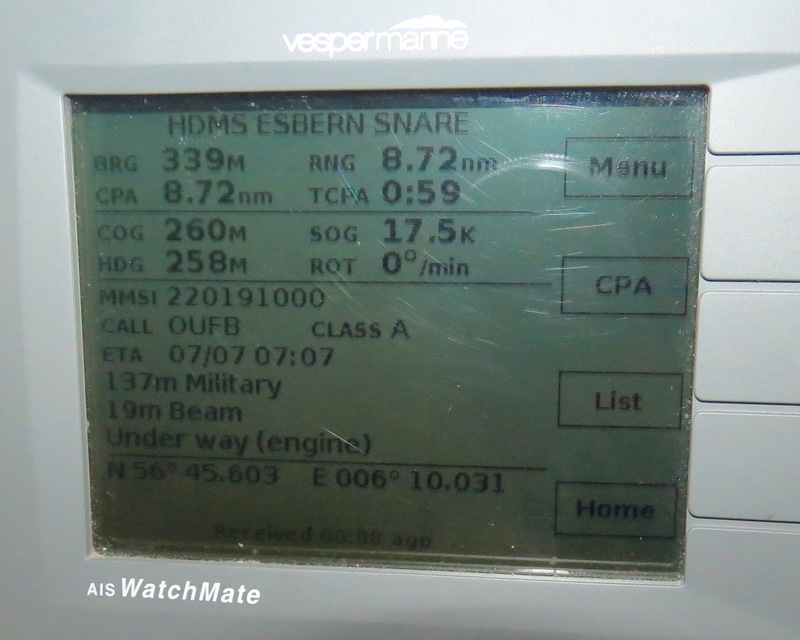 Additionally, we can contact the other ship’s pilot house by calling their Maritime Mobile Service Identity number (MMSI), a direct line listed on the AIS. On this trip we did so twice, with one of our calls resulting in our changing course for 15 minutes to provide more distance between JUANONA and a fishing boat dragging nets. 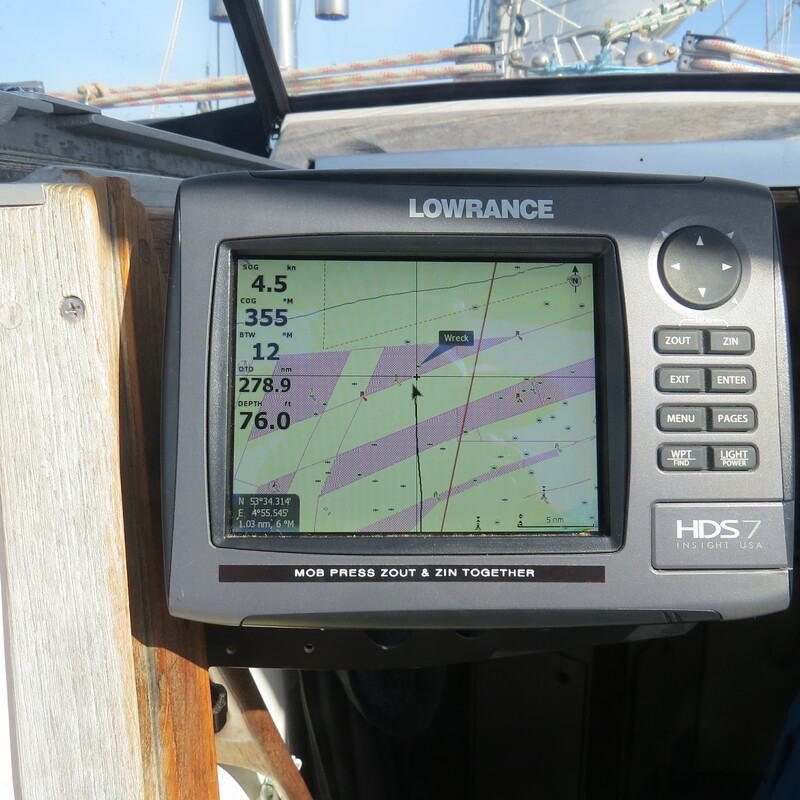 During our passage we navigated through several shipping lanes, which brings me to another electronic gizmo to which I also give thanks: our GPS Chart Plotter. This plotter includes area charts (easily changed with a SIM card for various destinations) with our GPS location overlaid on those charts. For instance, we’re supposed to cross shipping lanes at a 90º angle. 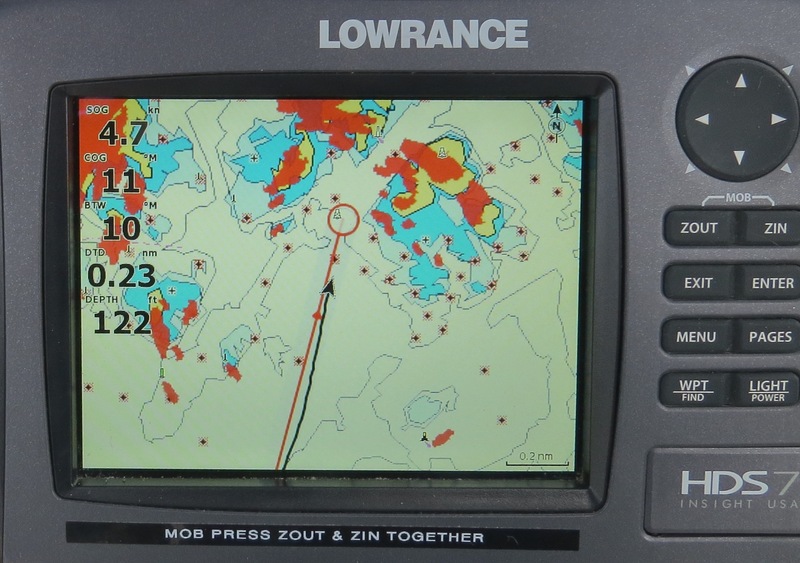 Our Chart Plotter shows our track across those lanes allowing us to quickly adjust our course as needed (black arrow is where we are with the red line showing our direct bearing or course to Norway). Luckily our GPS Chart Plotter provides an overlay of radar (indicated by those red splotches below that we later found out were due to a thunder and lightening storm). We, therefore, can pick up boats (such as small recreational vessels who don’t use AIS) as well as showing buoys and the outline of the shoreline. But, what would happen if our chart plotter and AIS equipment failed? Good question. As a back-up to our plotter, we’ve downloaded an app on Max’s iPad that provides almost the same information. 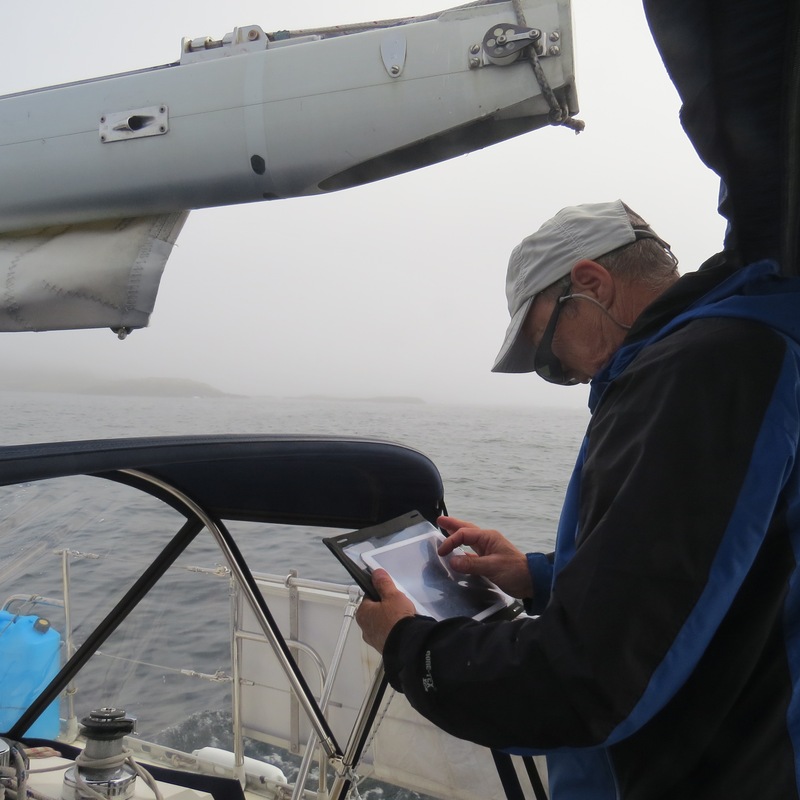 Frankly, around here there are so many rocks, being able to scroll in to highlight an area makes digital charting really valuable (as the photo below shows in our foggy entrance to Norway). And, if that fails, we have paper charts. I actually enjoy using printed charts for long passages because there’s nothing like marking your progress with little x’es along the way anticipating the last “x” when you arrive. 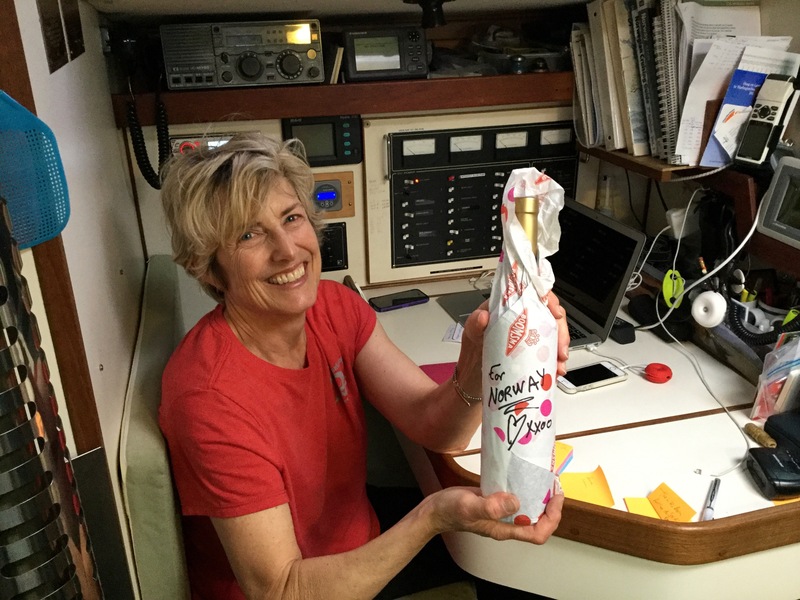 With this being only a three-day passage and with all the equipment behaving, I just checked our miles to destination on the plotter and divided it by our speed to get an idea of when we might arrive. Come to find out May 17 is the national holiday celebrating the signing of their constitution in 1814. 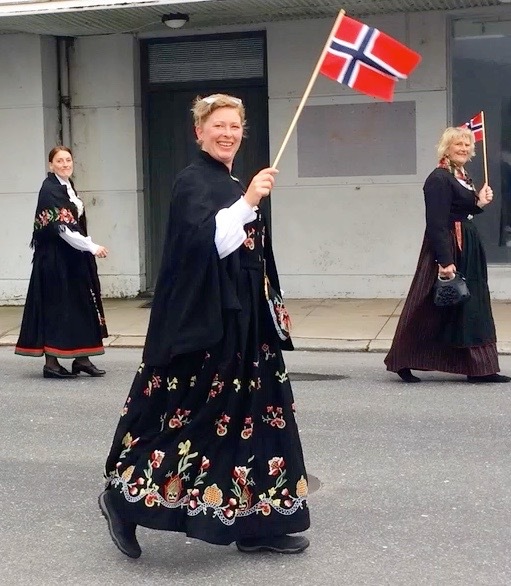 Instead of a military parade the procession through the streets is comprised of all ages. Children in particular are festive revelers on this day, no doubt looking forward to the traditional meal of hot dogs and ice cream. 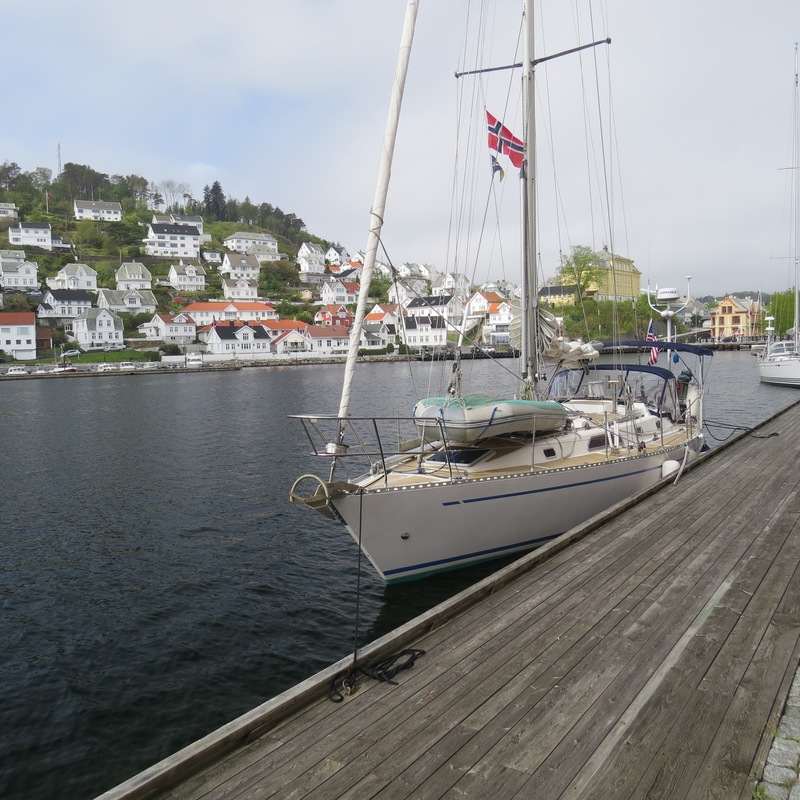 Arriving back to JUANONA we noticed another boat had come in, s/v EQUINOX with two Norwegians and one Swede aboard. Within an hour all five of us were on JUANONA discussing their upcoming plans. Their next stop is Scotland, as they continue to work their way down to the Canaries to reach St. Lucia in the Caribbean by the end of this year. They reminded us of our nephew Iain and his wife Sarah who, too, have planned some cruising time this summer after making arrangements with their companies. Great energy and spirits in all of them. 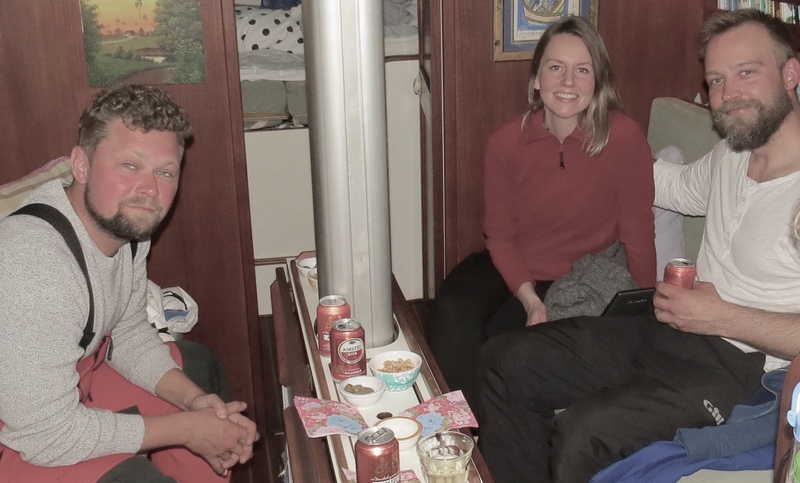 Having Camilia, Thomas, and Michael aboard was a wonderful welcome to Norway, similar to other times when we met Gunnar and Elisabeth in Os last year and Kjetil in Alesund in 2015. There’s something magical about meeting folks like them, a reminder of how sharing time with others is one of the main reasons we’re doing what we’re doing. And, just to give a shout-out: Michael owns a great cafe on an island called Styrso (near Gothenburg on the west coast of Sweden), called Öbergska, which we’re definitely planning to visit during our summer cruising. 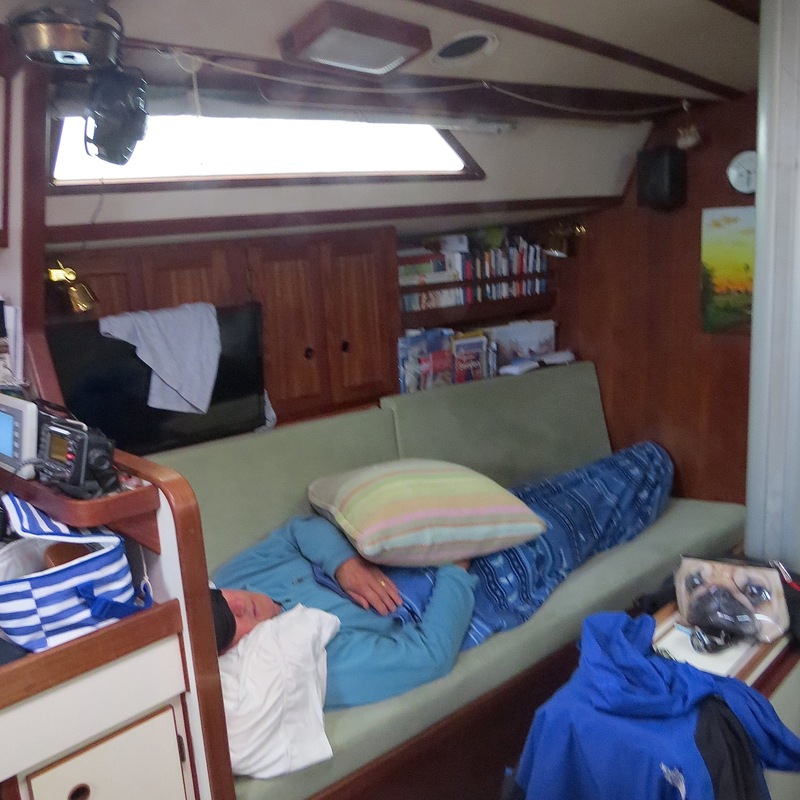 As I finish this passage-posting rain falls gently on JUANONA’s deck while we savor freshly brewed java in our v-berth and wifi-graze the news sites. I feel I should bow down every time I pass by our AIS and Chart Plotter. 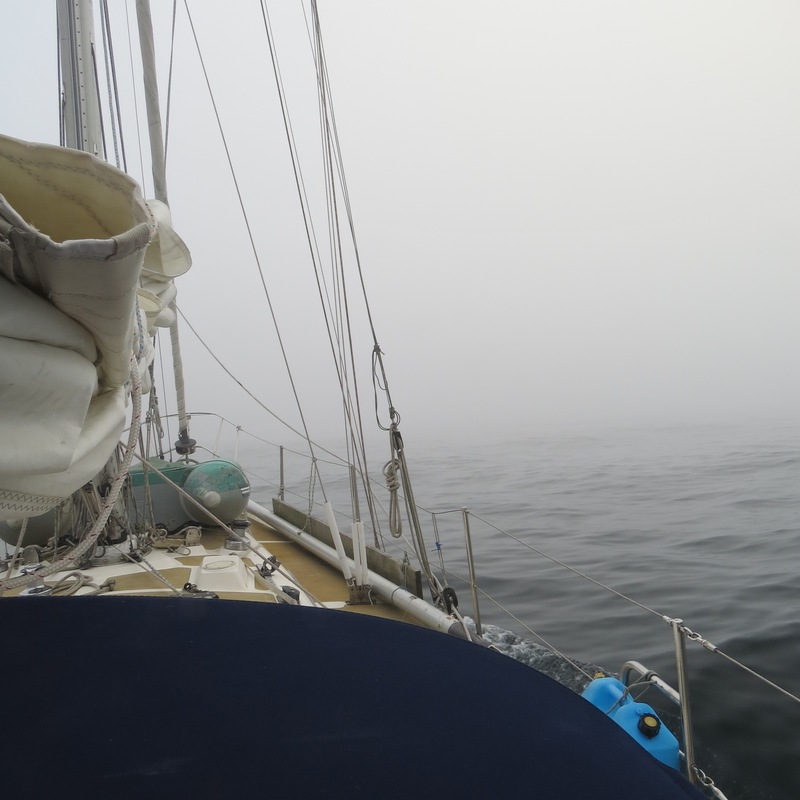 They take a lot of stress out of sailing in fog ! Nice to hear that your passage went well. We definitely agree with you about how valuable AIS is – we won’t leave port unless it is working properly. Have a great cruising season. Always nice to land on the other side. And, enjoy a great summer season as well!